Discover and purchase great new finds, create your shopping wishlist, and share with your friends with TheFancy.com’s app for iPhone, iPod Touch, and iPad simply known as Fancy. It is a curated shopping social networking website and iOS app similar to Pinterest, Facebook, Twitter, and Amazon. The Fancy iOS app has navigation reminiscent of Facebook’s iOS app, but the graphic punch and feed of items takes cues from Pinterest. A sliding left menu lets you browse all of the categories, check out deals, specific stores, add items to Fancy, monitor your order history, as well as find and invite friends. The browse feature is particularly successful. With a touch, all of the categories ranging from men’s and women’s clothes to pets to art to food to housewares appears. A feed selected from the browse menu or home screen scrolls vertically to check out more items. Once you select an item to examine in greater detail, you scroll using horizontal swipes on the screen. It is a nice perspective to have different gesture controls to give more texture and interest to the Fancy social shopping iOS app. When you want to check out an item. 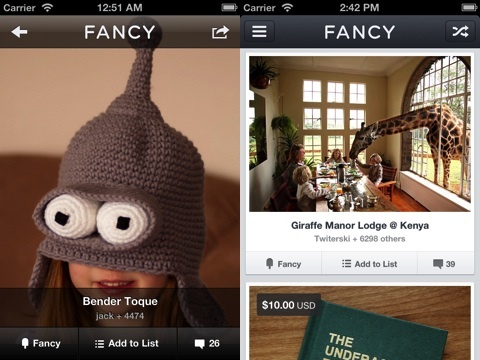 The price is displayed in the top left hand corner of the photo, and, for many items, you can buy through Fancy’s iOS app with quick, secure payment interface. If the item is not available specifically through the Fancy iOS app interface, you are directed to the product’s website for purchase. Also, for each item, you can fancy–essentially a like, add the item to a specific list you create, or comment. When you fancy an item, you can unlock special rewards and earn discounts. The typical “sharing” icon has some interesting, unusual ideas as well. You can select with one touch the following: where to buy, more info, show someone, post to Twitter, post to Facebook, share in email, and view on web. The gesture controls are fluid and agile, as you move through the visually striking Fancy iPhone app. With nod to Twitter, you can not only fancy an item, but you can also follow a fellow Fancy user and stores. You earn points and esteem when you fancy items, make purchases, add items, and attract followers. There is an impressive variety to the items available and the broad price range. You can check out cool housewares like sugar cube skulls, ice buckets, a chromatherapy shower. Or, fashion items ranging from a $20 chevron print skirt to a $2500 Givenchy handbag are available. The Fancy iPhone, iPod Touch, and iPad shopping and social networking app is chic, attractive, and highly functional. Although the download is free, you can easily spend lots of dollars. AppSafari review of Fancy was written by Jenni Ward on June 26th, 2012 and categorized under App Store, Free, iPad apps, Shopping, Social, Universal. Page viewed 4492 times, 1 so far today. Need help on using these apps? Please read the Help Page. Boxes – Make the most of your stuff.